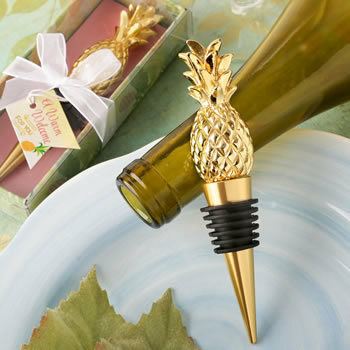 Bring these beautiful sentiments to your event tables with our golden pineapple bottle stopper. The stopper features a 3-dimensional design pineapple top crafted in poly resin. The pineapple is finished in a shiny gold plating. The bottom of the stopper is gold metal and has a black rubber gasket for a tight seal. Be on-trend and follow the hot pineapple craze! Size 4 1/2" x 7 /8"